2. Apply 5V on a 120 Ω resistor. Measure the current by putting the multimeter in series and parallel. Why are they different? For the trial in parallel, the electricity could now take a path with a much smaller resistance, essentially shorting the circuit and providing us with little or no value and confusing the multi-meter. The principal works for the same reason as it would if the multi-meter were just a resistor. A series connection and a parallel connection are completely different. For the series connection, the current will be 'shared' among the different components. This value will remain constant but the voltage across each component will change. For the parallel connection, there will be two separate paths in which the current can travel. The voltage across each component, however, will remain the same. 3. Apply 5 V to two resistors (47 Ω and 120 Ω) that are in series. Compare the measured and calculated values of voltage and current values on each resistor. The results shown in table six are as expected. The current measured through both objects in series are constant. They are then operating as a voltage divider. Ideally, the current passing through each component in series should be the same and the voltages should sum up to be equal to the Voltage Source. In this case, the measured voltages of R1 and R2 add up to 4.89. While this is close to the original 5V, this is not exact. Causes of this could be human error in measurement, standards of error on equipment, extra resistance in the wires/bread board, or not quite getting 5V from the power supply. 4. Apply 5 V to two resistors (47 Ω and 120 Ω) that are in parallel. Compare the measured and calculated values of voltage and current values on each resistor. Once again, the values in Table 7 don't quite add up to the ideal values from calculations, however, they are close. Similarly to the previous example, this could be caused by human error, instrument tolerance, extra resistance in wires/breadboard, inconstant power or a combination of any of those things. 5. 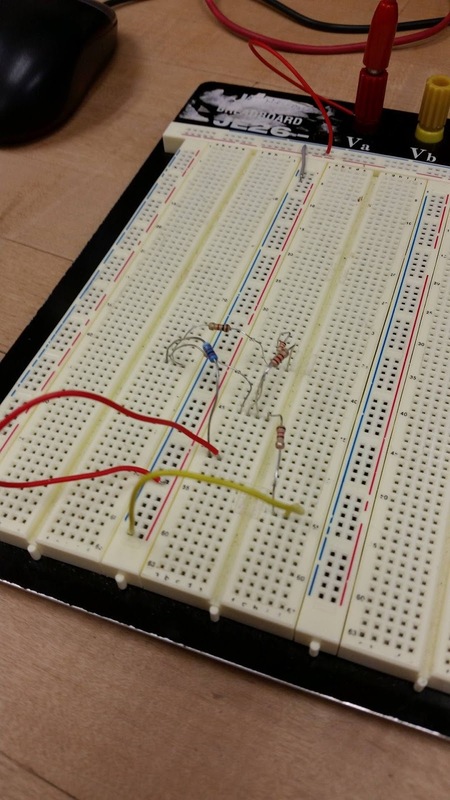 Compare the calculated and measured values of the following current and voltage for the circuit below: (breadboard photo) a. Current on 2 kΩ resistor, b. Voltage across both 1.2 kΩ resistors. The circuit shown on the breadboard above in which the values are derived for table 8 is show below as Figure 4. 6. What would be the equivalent resistance value of the circuit above (between the power supply nodes)? The equivalent resistance of the circuit shown in figure four is calculated to be 2.53 KΩ. 7. Measure the equivalent resistance with and without the 5 V power supply. Are they different? Why? When the power supply is on, we read a value of 0 KΩ. When the power supply was off, we read value of 0.567 kΩ. This is due to the way a multi-meter measures current. It applies a small test signal in order to evaluate the result and calculate a resistance. Since there is a voltage now being applied to the circuit, there will be new voltages and currents effecting the returning value to the multi-meter. This will force the multi-meter to make an incorrect calculation. 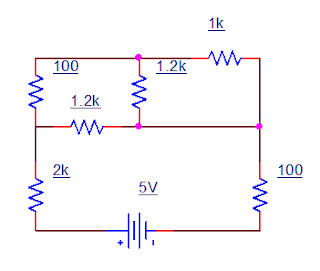 In this case, the minimum and maximum voltage that can be obtained at V1 is 5V for both. Since the potentiometer is in parallel with the source, as shown in the figure below, the only change that would if the resistance value provided by the potentiometer is adjusted is the current. This can be explained by Ohm's law. V/R = I . The 5V is constant, yet the resistance is being manipulated. That leaves the only variable left to change being the current. It's important to mention that the potentiometer cannot be turned to zero while in parallel with the power supply. This will create a short circuit and likely fry the component. 12. Explain what a voltage divider is and how it works based on your experiments. Voltage divider also known as the potential divider. Using the voltage divider we are able to calculate the output voltage. Voltage divider is used on the two resistors in our circuit with values of 1K and 5K Ohms. The final calculation of the circuit will look like 5k/(1k+5k) multiplied by the 5V voltage source..
13. Explain what a current divider is and how it works based on your experiments. Current divider is a simple linear circuit that produces the output current. By splitting the current between the branches of the divider. In our circuit we have the 1K and 5K resistors with the 5 voltage source. That's a very nice table for the first question. Though it might be more helpful if you include the circuit diagrams that go with lab. Thanks Matt and Ben, we were a little behind on our Blog work this week. We've taken your advice and done exactly that! Videos are missing. Thanks for responding to other comments. Let me know if you fix the videos or send me the links. I can see the videos now, thanks.